Democrat David Ige has a 4 percentage point lead over Republican Duke Aiona in the Hawaii governor’s race. 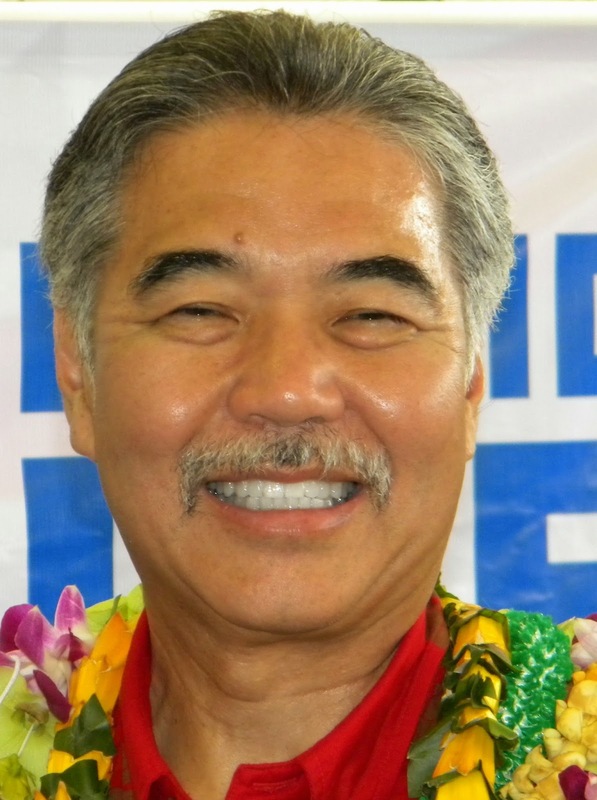 Ige, a state senator, is up 43 percent to 39 percent over Aiona, the former lieutenant governor. Just 8 percent of voters favor Mufi Hannemann, the former Honolulu mayor running as the candidate of the Hawaii Independent Party. Civil Beat. While Hawaii doctors get paid slightly more than the national average, the state has the third-highest cost of living, making it difficult to attract and retain physicians, according to the Hawaii Medical Association. Star-Advertiser. The Hawaii State Ethics Commission will consider a request this week by Civil Beat and the League of Women Voters to release the financial disclosure statements of dozens of powerful state board members. The news outlet and good-government group want the documents filed by members of the 15 boards that the Legislature unanimously required to publicly disclose their financial interests. Hawai‘i’s alternative industries get a boost. More than $5 million in federal grants will help develop Hawai‘i's agriculture, clean tech, manufacturing and healthcare industries. Hawaii Independent. Three Micronesians living in Hawaii are asking the U.S. Supreme Court to hear their case about being denied health benefits by the state. The appeal, which was submitted Sept. 9, is being described by attorneys for the plaintiffs as an urgent matter. Civil Beat. Robert Bley-Vroman, interim chancellor for the University of Hawaii at Manoa, has called for an internal review of the UH Cancer Center. Pacific Business News. Lava from the June 27 flow continued to advance slowly Sunday as fire fighters worked to contain a brushfire nearby. Hawaii County Civil Defense reported Sunday that the flow advanced 75 yards between its daily overflights. Tribune-Herald. A public hearing by the state House Health Committee is scheduled for 5 p.m. Monday at Kona Community Hospital in Kealakekua. Tribune-Herald. Companies, researchers looking for new ways to protect Hawaii’s reefs. West Hawaii Today. Today the U.S. Environmental Protection Agency issued an order requiring the County of Hawaii to repair the Hilo Wastewater Treatment Plant’s ocean outfall pipe. The pipe is leaking treated wastewater close to shore, posing a potential risk to the marine environment and public health. Hawaii Reporter. Only planes with nine passengers or less currently use Hana Airport, but the state is planning to add features that would allow the remote airport to accommodate larger aircraft with up to 30 passenger seats. Maui News. Fast-food chains at the Queen Ka'ahumanu Center were among the first Maui eateries to receive the state Health Department's new food safety placards, and so far, the store managers say they're happy with the new system. Maui News. The Kauai Fire Department wants to hear from the public about what kind of service it wants in the future. But meetings so far in Kapaa, Koloa and Kilauea drew little interest. Garden Island. The first in a two-part series looking at a loophole in the medical marijuana industry that allows patients to possess and use the substance, but not obtain it unless they grow it themselves. Garden Island. The second in a two-part series looking at a loophole in the medical marijuana industry that allows patients to possess and use the substance in Hawaii, but not obtain it unless they grow it themselves. Garden Island. His Island, His Vision. Larry Ellison plans to triple the size of tiny Lanai City and double the population. First there was the world's largest pineapple plantation. Then there were a pair of fancy resorts. As the principal industry on Lanai, neither was diversified and both proved financially unsustainable. Star-Advertiser.